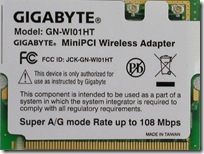 The GN-WI01HT SUPER A/B/G Mini-PCI Adapter delivers the fastest full solution wireless today. Dual band support at 108Mbps, up to 15 times faster than existing 802.11b networks while still backward compatible. Two antenna connectors provide antenna diversity, greater coverage and signal. Wireless connections are secured with the support of WPA/WPA2, WEP, AES and 802.1x securities.